Are you interested in learning more about the vibrant language and culture of Ireland? If so, this beginning Irish language course is just for you! These courses are being offered on a non-credit basis, to the Helena community, for enrichment purposes. We invite Carroll faculty, staff and students to participate-- but do keep in mind the classes are not offered as part of our college catalog and therefore are not included in tuition. No prior knowledge of the Irish language is required. 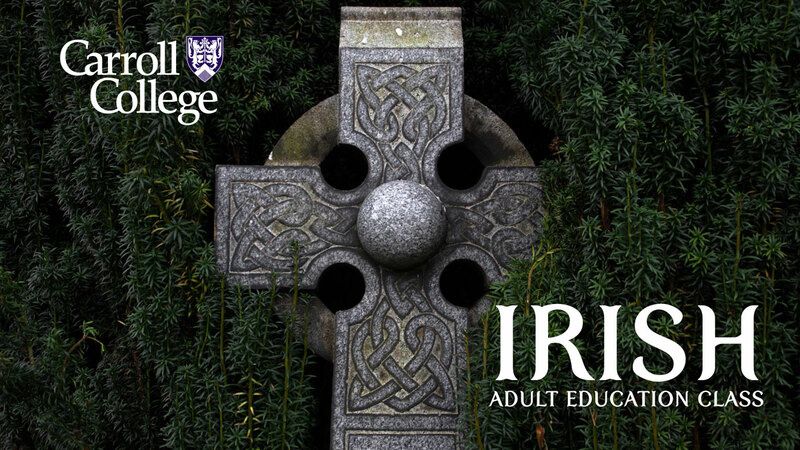 The course provides an enjoyable introduction to modern Irish, focusing on basic language skills and preparing students to conduct conversations and read authentic texts. Extensive use is made of role play and interactive teaching methods. The rudiments of the Irish language are introduced, including phonemes and pronunciation, syntactical structure and verbal conjugations. In addition, a general introduction to Irish culture and the history of the language is provided. Class meets on Carroll College Campus (classroom to be announced) on Tuesday evenings, from 6:00 - 7:30pm, from September 18 through 20 November, 2018. This non-credit beginning Irish class will run for 10 weeks (15 hours). This course will be a continuation of the Spring Beginner's Irish Language Class. This course builds on the grammatical lessons of Beginner's Irish I, and expands into more complex verbal conjunctions while concentrating on idiomatic expressions. The accumulation of vocabulary is stressed, and students are introduced to basic literature in Irish while developing beginning conversational fluency. This ten-week class meets on Thursday evenings, from 6:00 - 7:30pm, on the Carroll College Campus (classroom to be announced). The course begins September 20 and concludes November 29, 2018. To register, visit our online marketplace.